Sniper Tower. The Sniper Tower is the first defensive building in the Boom Beach that is open from the 1st level of Headquarters. Looks like classical tower for shooting with a sniper on the top of it which is armed by powerful rifle. 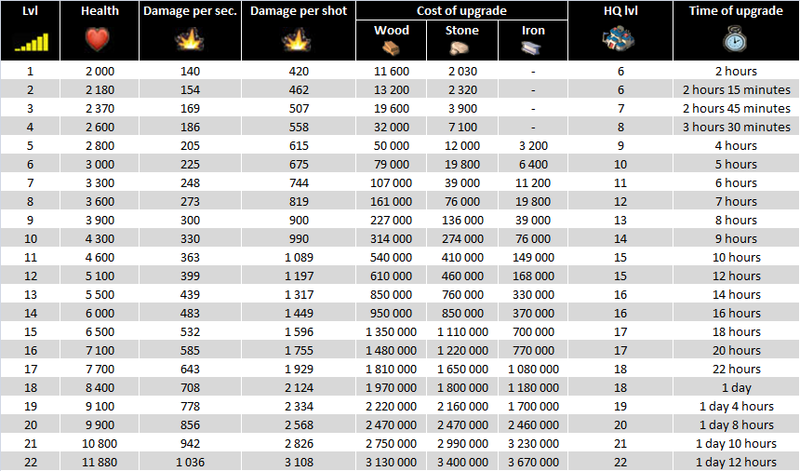 The damage from the Sniper Tower in Boom Beach depends on its level. The rate of fire is 1 shot per 1.4 sec. 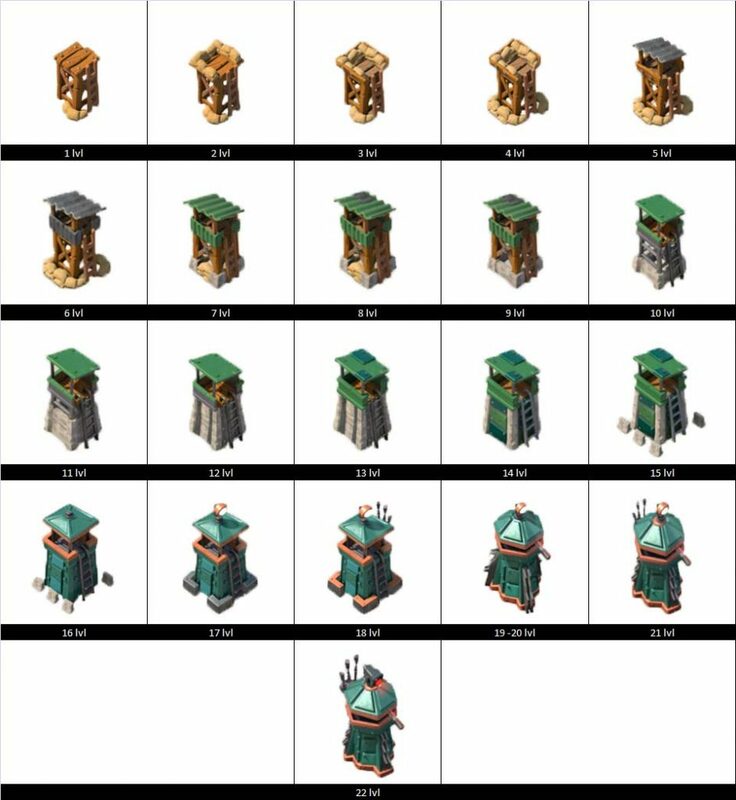 Amount of available Sniper Towers in the Boom Beach is from 1 to 6 according to the level of Headquarters: from the 1st level of Headquarters is only 1 Sniper Tower available; from the 2th level – 2 Sniper Towers are available; from the 5th level – 3 towers; from the 8th level – 4 towers; from the 12th – 5 towers and from the 15th – 6 towers. The Sniper Tower in Boom Beach has 22 levels. The upgrade process changes its appearance, increases the damage power and stock of health. Mortar. The Mortar in Boom Beach is the second of the eight main types of defensive buildings and is available from the 3rd level of Headquarters. 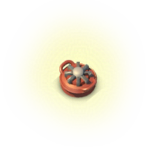 The Mortar in Boom Beach is a prototype of classical mortar in late Middle Ages (except of the last levels) that shoots with explosive bombs. 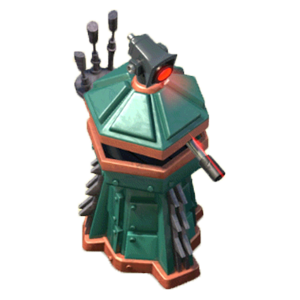 Distinctive feature of the Mortar is ability to cause damage for group of enemy troops (an every unit gets damage near explosion of mortar shell). The damage from the Mortar in Boom Beach depends on its level. The rate of fire is low – 1 shot per 5 sec. 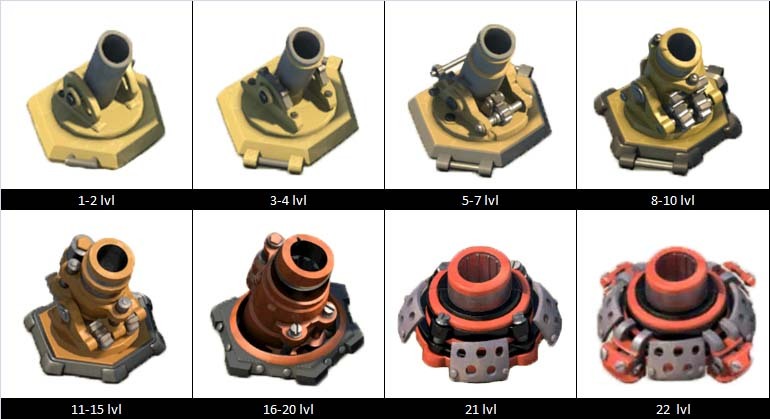 Amount of available Mortars in the Boom Beach is from 1 to 4 according to the level of Headquarters: from the 3rd level of Headquarters is only 1 Mortar available; from the 7th level – 2 Mortars are available; from the 12th level – 3 Mortars and from the 18th – 4 ones. 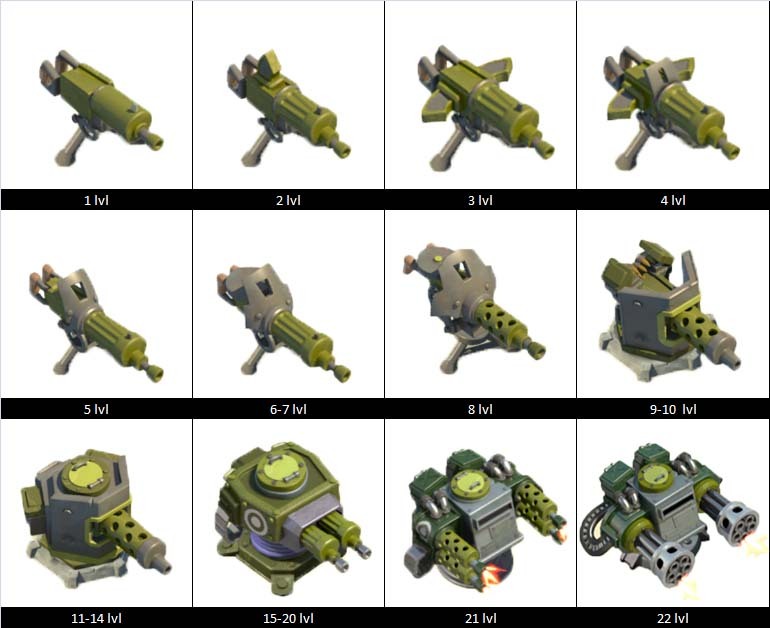 The Mortar in Boom Beach has 22 levels. The upgrade process changes its appearance, increases the damage power and stock of health. Machine Gun. The Machine Gun in Boom Beach is the third of the eight main types of defensive buildings and is available from the 4th level of Headquarters. It features is a high rate of fire (10 shoots per 1 sec) with medium range of fire and relatively low damage power. Shooting accuracy of Machine Gun is low but it increases with decreasing distance to the target. The Machine Gun in Boom Beach is an effective defensive tool against Rifleman, Zooka and Warrior. Not effective against other units due to low damage power. Amount of available Machine Guns in the Boom Beach is from 1 to 5 according to the level of Headquarters: from the 4th level of Headquarters is only 1 Machine Gun available; from the 6th level – 2 Machine Guns are available; from the 10th level – 3 ones; from the 13th – 4 ones and from the 16th – 5 ones. The Machine Gun in Boom Beach has 22 levels. The upgrade process changes its appearance, increases the damage power and stock of health. Cannon. The Cannon is the fourth from the eight defensive buildings in Boom Beach and is available from the 6th level of Headquarters. The Cannon makes single shots by shells with high damage power but has low rate of fire (1 shot per 3 sec). The Cannon in Boom Beach is very effective against units with huge stock of health (Heavy, Tank, Scorcher) and less effective against other kind of troops due to low rate of fire. It is recommended to install Machine Gun or Sniper Tower near the Cannon to cover it from enemy infantry. 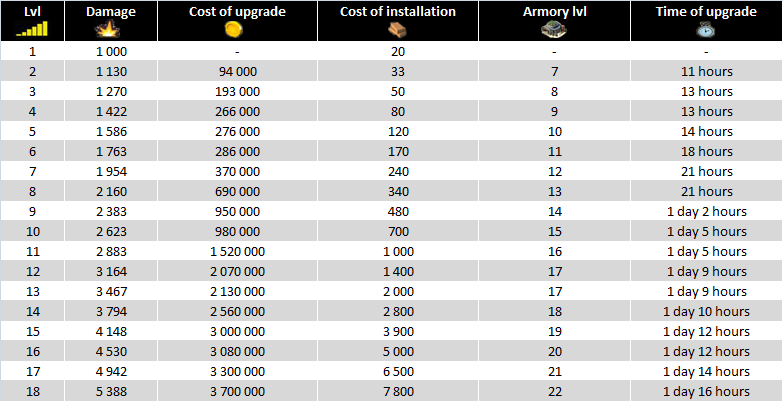 Amount of available Cannons in the Boom Beach is from 1 to 6 according to the level of Headquarters: from the 6th level of Headquarters is only 1 Cannon available; from the 8th level – 2 Cannons are available; from the 10th level – 3 ones; from the 11th – 4 ones; from the 16th – 5 ones and from the 19th – 6 ones. The Cannon in Boom Beach has 22 levels also. The upgrade process changes its appearance, increases the damage power and stock of health. Flamethrower. The Flamethrower in Boom Beach is the fifth of eight main defensive buildings in the game and is available from the 9th level of Headquarters. It has short range of attack and relatively high damage power. The feature of the Flamethrower is ability to attack a few targets simultaneously. All targets attacked by Flamethrower continue to burn during 5 sec after attack taking an extra damage. The weakest side of Flamethrower is short range of attack. Due to that flaw it almost powerless against Zooka, Tank and Grenadier. The most effective Flamethrower is near the Headquarters for defense against Warriors. The Flamethrower is also effective installed on the shore to attack enemy troops during their landing ashore. Amount of available Flamethrowers in the Boom Beach is from 1 to 4 according to the level of Headquarters: from the 9th level of Headquarters is only 1 Flamethrower available; from the 11th level – 2 Flamethrowers are available; from the 14th level – 3 ones and from the 17th – 4 ones. 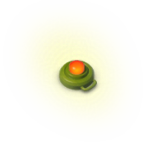 The Flamethrower in Boom Beach has 19 levels. The upgrade process changes its appearance, increases the damage power and stock of health. Boom Cannon. The Boom Cannon in Boom Beach is the 6th of eight main types of defensive buildings and is available from the 12th level of Headquarters. The Boom Cannon makes single shots by shells with huge damage power. The range of fire is high but low rate of fire (1 shot per 4 sec). 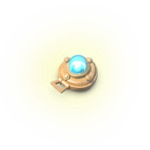 The Boom Cannon is effective against units with huge stock of health (Heavy, Tank, Scorcher) and less effective against other kind of troops due to low rate of fire. It is recommended to install Machine Gun or Mortar near the Boom Cannon to cover it from enemy infantry and Critters. 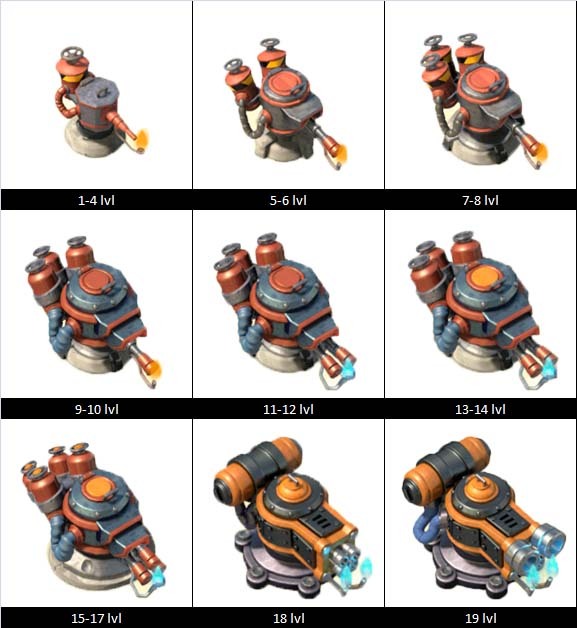 Amount of available Boom Cannons in the Boom Beach is from 1 to 5 according to the level of Headquarters: from the 12th level of Headquarters is only 1 Boom Cannon available; from the 14th level – 2 Boom Cannons are available; from the 17th level – 3 ones; from the 20th – 4 ones and from the 21th – 5 ones. The Boom Cannon in Boom Beach has 16 levels. The upgrade process changes its appearance, increases the damage power and stock of health. Rocket Launcher. 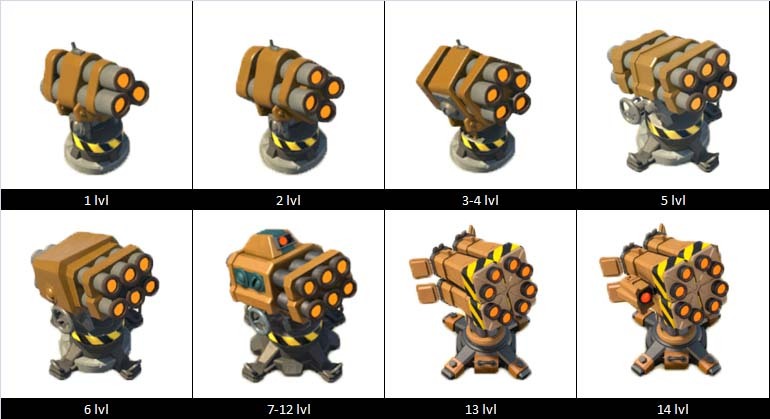 The Rocket Launcher in Boom Beach is the 7th of eight main types of defensive buildings and is available from the 13th level of Headquarters. It shoots a volley from six missiles in series one after another. The pause between volleys is 5 seconds (time for reloading). 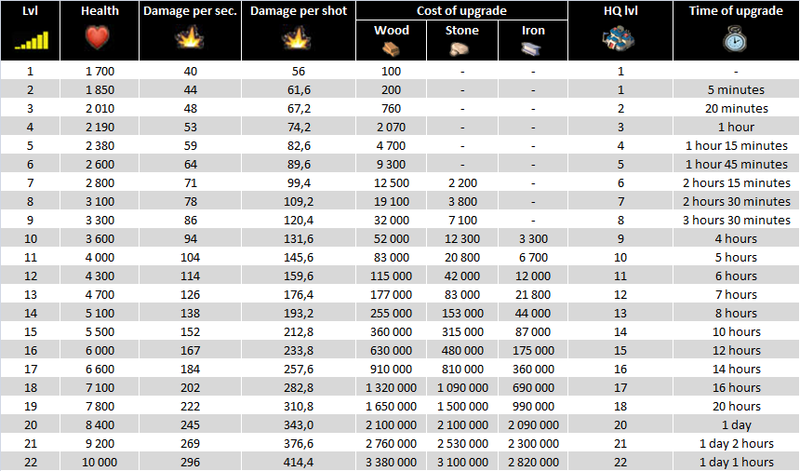 The Rocket Launcher has the biggest range of fire in compare with other defensive weapons. 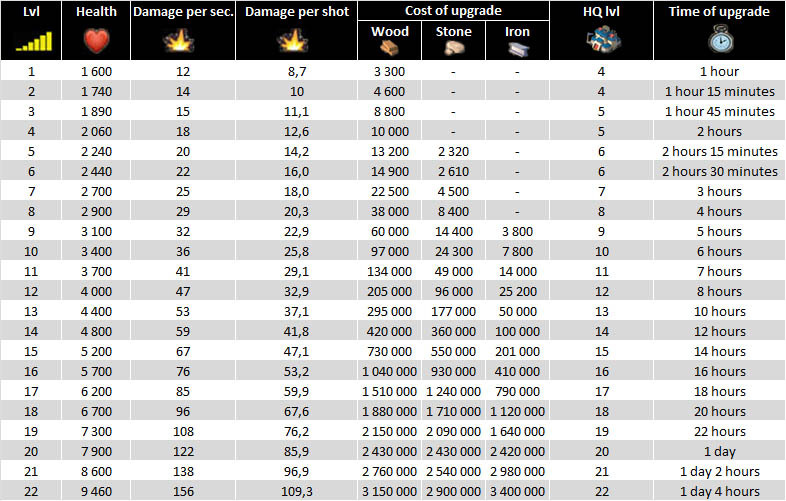 The damage power is relatively small but it increases after each upgrade. 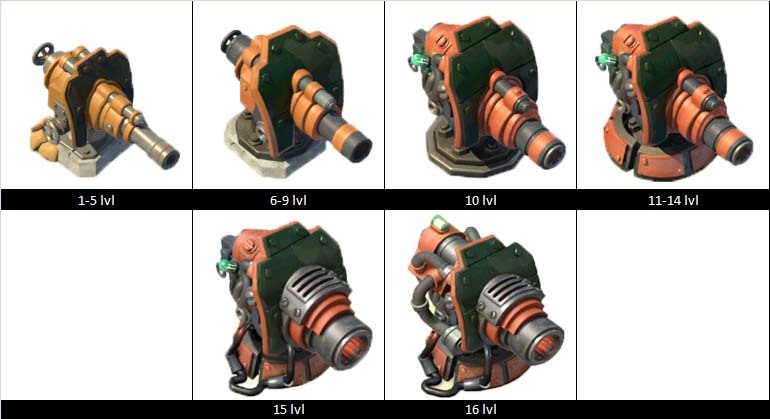 Distinctive feature of the Rocket Launcher is ability to cause damage for group of enemy troops (an every unit gets damage near explosion of missile). It is an excellent means of defense against Rifleman, Zooka, Grenadier, Cryoneer and Warrior. Less effective against units with big stock of health. 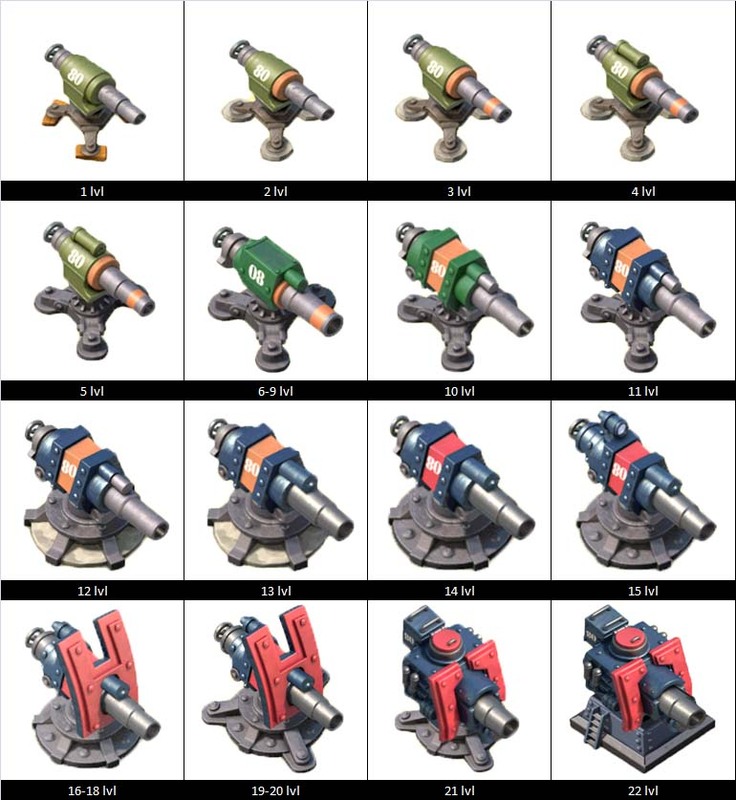 Amount of available Rocket Launchers in the Boom Beach is from 1 to 3 according to the level of Headquarters: from the 13th level of Headquarters is only 1 Rocket Launcher available; from the 16th level – 2 ones are available and from the 19th – 3 ones. The Rocket Launcher in Boom Beach has 14 levels. The upgrade process changes its appearance, increases the damage power and stock of health. Shock Launcher. 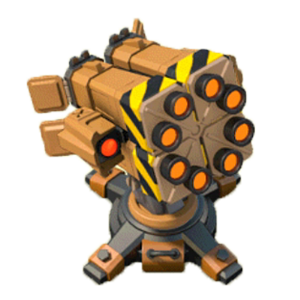 The Shock Launcher in Boom Beach is the last type of defensive buildings and is available from the 17th level of Headquarters. 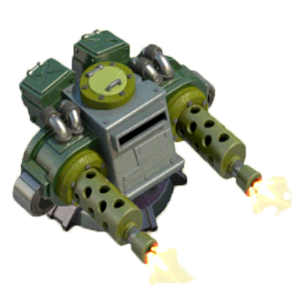 It fires shock bombs (looks like some kind of electrical pulse when it flies) which puts out of action all enemy troops for the short period of time. All troops which hit to the bomb action area can’t move and shoot. The rate of fire of Shock Launcher is 1 shoot per 5 sec. The damage power is low but big range of fire. Distinctive feature of the Shock Launcher is the biggest stock of health from the all defensive buildings. It is an excellent means of defense against all kinds of units. 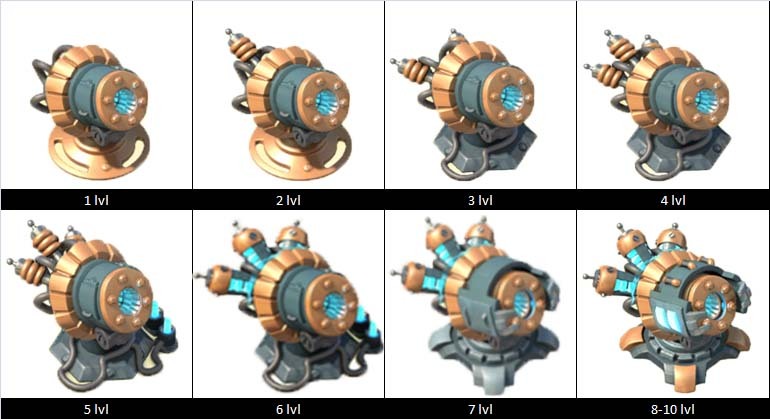 Amount of available Shock Launchers in the Boom Beach is from 1 to 2 according to the level of Headquarters: from the 17th level of Headquarters is only 1 Shock Launcher available and from the 20th level – 2 ones are available. 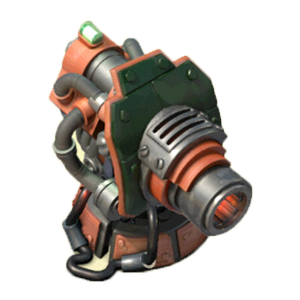 The Shock Launcher in Boom Beach has 10 levels. The upgrade process changes its appearance, increases the damage power and stock of health. Mine. The Mine in Boom Beach is a kind of analogue of the classical anti-personnel fragmentation mines. When anyone from all enemy units comes close to the mine it explodes causing damage to all nearby troops. 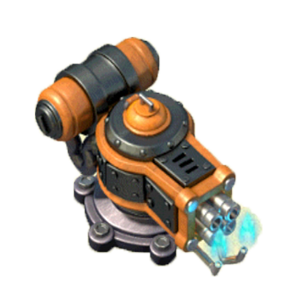 The Mine in Boom Beach has a middle damage power and is effective defensive tool against Rifleman and Zooka. Distinctive features of Mines (all 3 types) from other defensive tools are absence of influence from “blue” statues and way of upgrade (with the help of Armory). Mines in Boom Beach are available from the 2nd level of Headquarters. 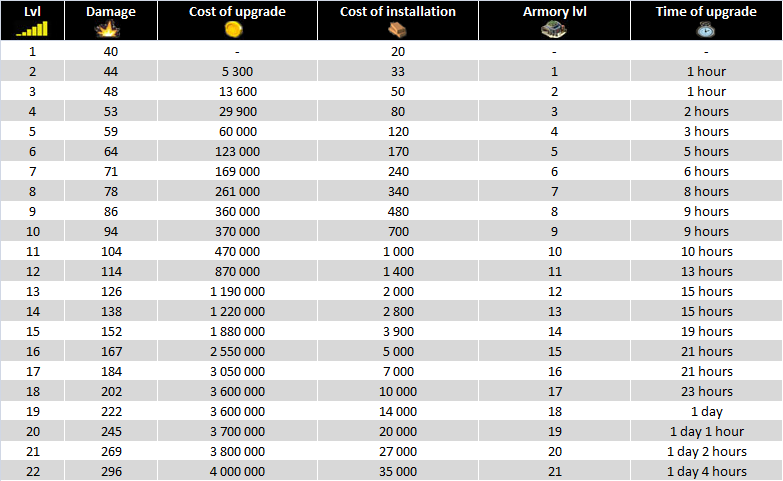 Amount of available mines is from 3 to 24 ones: from the 2nd level of Headquarters only 3 mines are available; from the 4th level – 6 ones are available; from the 6th – 9 ones; from the 8th – 12 ones; from the 11th – 15 ones; from the 14th – 18 mines; from the 17th – 21 mines and from the and from the 20th – 24 ones. The Mine in Boom Beach has 22 levels. 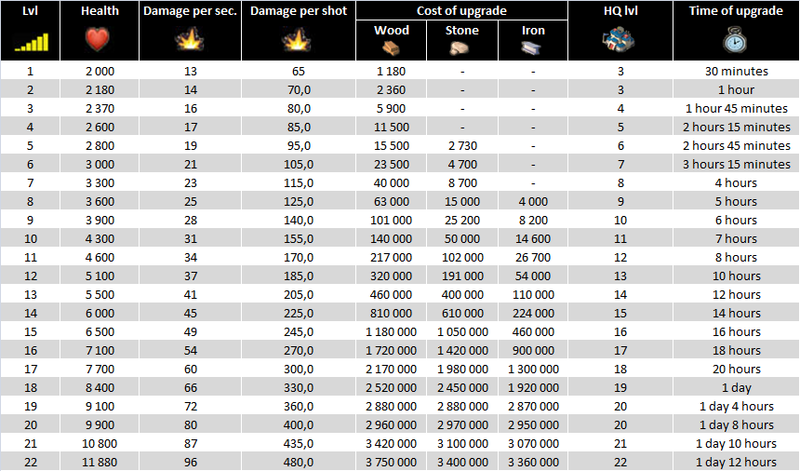 The upgrade process changes only damage power. Boom Mine. 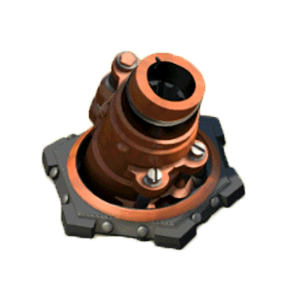 The Boom Mine in Boom Beach is a kind of analogue of the classical anti-tank mine with enormous damage power. Boom Mine is not able to cause damage to a group of troops. This mine designed as an additional means of protection against units with big stock of health (Tank, Scorcher, Heavy etc.). Distinctive features of Mines (all 3 types) from other defensive tools are absence of influence from “blue” statues and way of upgrade (with the help of Armory). The Boom Mine in Boom Beach is available from the 10th level of Headquarters. Amount of available mines is from 1 to 6: from the 10th level of Headquarters only 1 Boom Mine is available; from the 12th level – 2 ones are available; from the 14th – 3 ones; from the 16th – 4 ones; from the 18th – 5 ones and from the and from the 20th – 6 ones. The Boom Mine in Boom Beach has 18 levels. 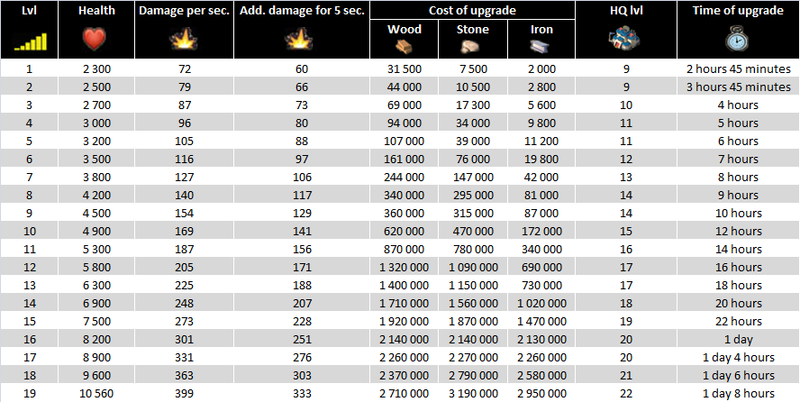 The upgrade process changes only damage power. Shock Mine. 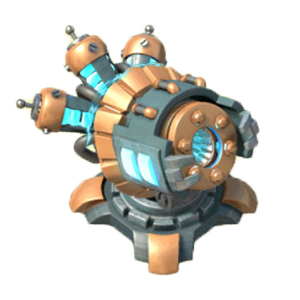 The Shock Mine in Boom Beach after activation puts out of action all enemy troops for the short period of time and causes additional damage for them. All enemy units that are near the mine in the moment of it explosion freeze in a place and can’t move and shoot. 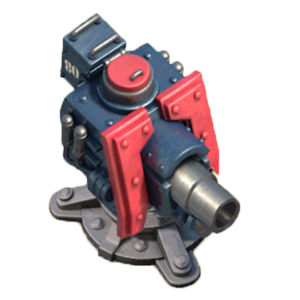 The Shock Mine equally effective against all types of troops in the Game. It is recommended to install Shock Mines before other defensive buildings. In such case defensive weapons would be able to destroy enemy units when they are out of action. Only 3 Shock Mines are available in the Game. All 3 mines unlocks from the 21 level of Headquarters. The Boom Mine in Boom Beach has 5 levels only. The upgrade process changes damage power and duration of freeze effect.